Explore 100 square miles (256 square kilometer) of varied terrain, ranging from the open farm fields and dense forests to frozen tundras and the savanna. The vast world of theHunter: Call of the Wild is split up into separate and distinct hunting reserves, each one filled with surprises and memorable moments. Take on missions and challenges from the locals, or go off the beaten path. Discover lookouts, hunting towers and outposts. Tired of walking between your hunts? Get the ATV Saber 4×4 and drive around! This capable vehicle will carry you across rough terrain at breakneck speeds. Exploring the open world has never been more fun. With it’s 4 diverse reserves and national parks you will encounter 25 species to hunt (and we keep adding new ones) each providing its own challenge. From the classic and most popular medium game like whitetail deer to big game like Bears and Elks. Track the ever elusive Lynx in frozen forests of Medved-Taiga, take to the skies in Hirschfelden and bag some goose or meet the cape Buffalo while you explore the the hot Vurhonga Savanna. Many weapons are available for in-game and you can equip yourself with rifles, handguns and bows and customize them with scopes and different ammunition types. Find and master your favorites. Practice and steady your aim at the shooting range. Develop your character by unlocking various skills and equipment. Learn how to use callers and scents, but above all else, study your prey: pay close attention to animal behavior, traits and patterns of movement. Share Hunting Experiences and the Hunt Club. Earn Bragging Rights. In addition to its rich single player experience, theHunter: Call of the Wild offers unique multiplayer options. Join up to 8 friends (or complete strangers!) in cooperative and competitive modes. 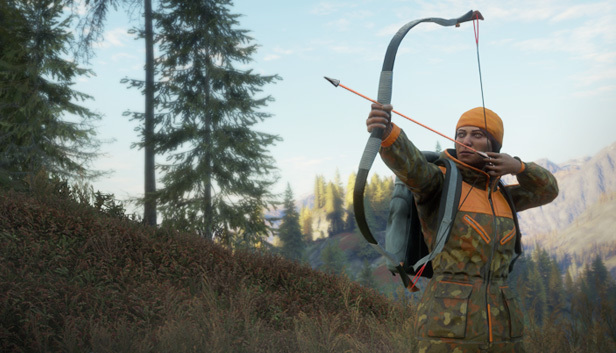 Enjoy a wide range of in-game challenges and events, with the Hunt Club. Take part in daily, weekly or community events to earn in-game rewards.